The 8N hydraulic system is simple yet elegant and works great when properly adjusted and maintained. It consists of a pto driven piston type pump with internal control valves and a lift cylinder connected to the rear lift arms. The control lever and quadrant moves the valve spools on the pump to control the lift. The most common complaints are addressed below. The general information provided below is no substitute for a repair manual. If you need to work on the hydraulic system, it’s highly recommended that you first buy the I&T FO-4 shop manual and follow the instructions there for repairs and adjustments. It’s also highly recommended that you change the hydraulic oil (gear oil) and keep it fresh and clean at all times. The oil sump holds 5 gallons that is shared with the transmission and rear end of the tractor. It has a tendency to accumulate moisture from condensation inside the gear cases and the water collects in the bottom of the sump where it is drawn directly into the hydraulic pump. In cold climates the water can freeze and break the chambers in the pump. You definitely don’t want that to happen. If the oil looks milky, it’s got water in it. Change it. If the lift won’t raise at all, first make sure the pto is engaged and the pto shaft is turning as it should be. Make sure the oil level isn’t low. If those two things check out ok turn off the engine and remove the right side access cover (the one with the dipstick) and slide your hand down along the control rod into the oil and feel the end of the rod where it goes into the control valve pivot. Make sure the rod is connected and that it is moving the control valve spools in and out as you move the lift control lever up and down. Other possibilities are a defective relief valve or a ruptured oil tube that goes from the pump base to the top cover. To check these, leave the side cover off and start the tractor. Have a fairly heavy weight or load on the lift arms. Raise the lift control lever and watch inside the cavity for oil spraying out in the area of the relief valve or from the side of the cavity where the tube is located. If no oil is spraying out anywhere, you could have a bad pump. Check the pump pressure as outlined in the I&T FO-4 manual. This is a very common complaint and can almost always be attributed to a worn cam follower pin in the lift control linkage. Loosen the 4 bolts holding the quadrant control lever bracket to the top cover. Slide the quadrant bracket toward the rear of the tractor (bolt holes are elongated). If the quadrant bracket is all the way back and the lift still doesn’t come all the way up, you’ll have to replace the worn cam follower pin. Remove the top cover and place it bottom side up on the workbench. 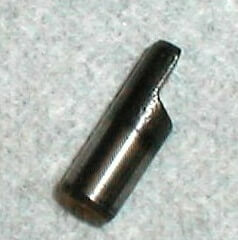 Find the worn pin. Disassemble the control linkage until you can get the part with the worn pin out of there. Press or drive the worn pin out. Replace with the correct hardened dowel pin part number 374072S from Ford/New Holland. This is listed as a 5/16″ x 7/8″ dowel pin but it is actually .309″ diameter not 5/16″ (.3125″). Pressing or driving a common .3125″ pin into the .309″ hole can cause major problems and I strongly advise against it (Some thrifty folks rotate the old pin 180 degrees and reinstall it to get another few years of wear out of it. That usually works ok if you can’t spare the two bucks for a new one). Reassemble the linkage and adjust as per the shop manual instructions. Many times you will find that simply replacing the worn pin will take care of the problem without any further adjustments, but you have to completely reassemble the tractor to find out if you are lucky or not. Before replacing the top cover, take the time to inspect everything else in there for wear or other problems. This is an excellent time to rebuild the lift cylinder also. See the next question. Leakdown is probably the most common complaint with the N tractors, but it’s usually easy to fix. If you have an implement on the lift and it drifts down over a few minutes time after the tractor is shut off you have some leakage. If the implement drops as soon as you push the clutch pedal in, you have major leakage. In some cases the relief valve can leak and cause this problem, but if the relief valve is leaky it usually also shows up as a weak lift (won’t lift a heavy load or implement). The control valve spools in the pump base can leak due to scoring in the bores but this is rare and generally not repairable except by a major pump rebuild. The most common cause of leakdown is worn lift cylinder piston rings. You can determine if the leakage is coming from the lift cylinder by removing the right side cover (the one with the dipstick) and starting the tractor. Have a fairly heavy weight or load on the lift arms. Raise the lift control lever and watch inside the cavity for oil leaking out from above in the area of the lift cylinder. If the cylinder is leaking, you will see it. If the relief valve is leaking you will see the oil bubbling up from the pump area. The N tractors originally had a piston with 3 cast iron rings to seal it. These rings are still available, inexpensive and will work just fine, but a small amount of leakdown is normal and is to be expected with them. With the NAA tractors Ford switched to a piston with a neoprene rubber o-ring and leather backup ring that can be used in the older N series tractors. This provides a much more positive seal to eliminate the small leakage from the cast iron rings. The NAA piston and seal will cost more to replace than just buying new cast iron rings. The determining factor in which way to go is the condition of the cylinder bore. Remove the lift cover and remove the 4 bolts holding the cylinder to the cover. You can remove the piston fron the cylinder by applying a little compressed air to the oil inlet hole in the cylinder. Don’t use a high pressure or you’ll blast the piston out of there like a rocket. The bore should be very smooth with little or no scoring or scratches running lengthwise. It can (and probably should) be lightly honed to a cleanup. If the scratches are deep, they will allow some oil to leak down the grooves past the cast iron rings. In this case the NAA seal will work better, but only for a short time. The scratches or grooves will chew into the new neoprene seal and it will leak worse than ever. If you have deep scratches and do not want to spend the money to replace the entire cylinder assembly you should use the cast iron rings and live with the small leakage. If the cylinder bore is in good shape or has only very faint scratches or grooves use the NAA piston and seal. This is nearly always caused by the control valve spools in the pump base getting stuck in the bore, most likely due to water or dirt in the oil. 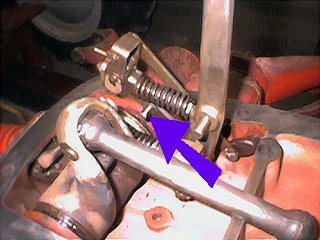 Turn off the engine and remove the right side access cover (the one with the dipstick) and slide your hand down along the control rod into the oil and feel the end of the rod where it goes into the control valve pivot. Make sure the rod is connected and that it is moving the control valve spools in and out as you move the lift control lever up and down. Chances are, you will find that the valve pivot is stuck and not moving. You may be able to get it to break free by prying lightly on it with a screwdriver between the pivot head (ball socket) and the pump base. When it breaks free and starts working again, CHANGE THE OIL. If it’s really stuck tight, you’ll have to pull the pump and rebuild it. This could be severe leakage at the cylinder, a bad relief valve, or a badly worn pump. Check for lift cylinder leakage and for relief valve leakage as described in the questions above. If no major leakage is noted, then check the pump pressure as outlined in the FO-4 manual. A rebuild is probably in order. What you’re hearing is the sound of cams/pistons in the pump banging together. When the pump is new you get a slight knocking as the lift reaches the set height. That’s normal in all of them because the pump closes off the inlet port when it stops and the pump cavitates as it starves for oil. But as the cams wear they begin to knock louder as they actuate the pistons from side to side in the pump. The louder the knock, the more wear your pump has on it. It’s generally not an immediate pressing problem. If the knock is faint you can probably put off repairs for quite a while. If it’s knocking loudly you should buy a pump repair kit and do a rebuild before it quits all together. Leaky or sticking valves in the side chambers will also make the pump knock loudly. This is usually a sign of a defective or sticking valve in the pump. The pump piston pushes the oil out then pulls it back in as it returns. Time for a pump rebuild.